Ng Yong Leng (middle) backstage interviewing Rita McGrath (left) with a fellow Laureate broadcast anchor. Ng Yong Leng from INTI International College Subang and Teoh Pei Gent from INTI International College Penang were ecstatic to network with business movers and shakers during the two-day conference, which featured business moguls and thought-leaders such as Sir Ken Robinson, Blake Mycoskie and Simon Sinek, whom the students had the privilege to meet with behind the stage.Yong Leng, who served as a broadcast anchor at the World Business Forum, also had the privilege of interviewing other ‘provocateurs’ backstage during breaks between sessions. “I had the chance to interview speakers like Rita McGrath, whom I admire for her insights into businesses that succeed without relying on competitive advantage. This whole trip was an eye-opening experience for me and to be part of such a world class event was just surreal,” shared Yong Leng, a final year business degree student from INTI International College Subang. An opportunity available only to students within the Laureate International Universities network – which INTI is part of – participation in the World Business forum required both Yong Leng and Pei Gent to undergo rounds of interviews prior to being selected to represent INTI at the event. Through the Laureate Live platform, students within the Laureate network also have access to the broadcast of these world class events. Aired at all of INTI’s five campuses across Malaysia, the forum provided students the unique opportunity to listen to the keynote addresses by world renowned speakers. 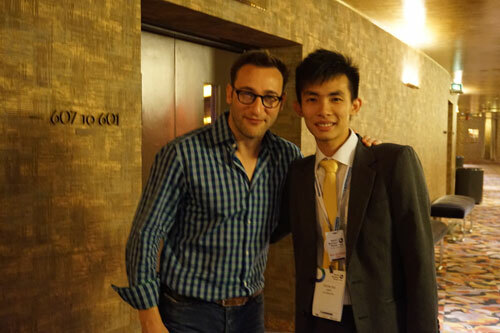 Teoh Pei Gent (right) with Simon Sinek – one of the presenters of the World Business Forum. “The World Business Forum was insightful, thought-provoking and inspiring. Furthermore, I had the opportunity to network with my peers from various Laureate universities worldwide to share intellectually stimulating discussions on topics that arose from the forum itself. I am appreciative of this amazing opportunity on such a global platform provided by INTI and Laureate,” shared Pei Gent. Making full use of their time in New York City, Yong Leng and Pei Gent explored the metropolis with their new friends. From subway rides to sightseeing, the experience was an adventure for the two friends on their first overseas trip. Through international exposure like this, INTI students are able to learn beyond the four walls of the classroom and greatly enhance their individual development.